2. Healthy octo-corals 3. Deserted beaches are not a rarity 4. Manta ray in shallow water. 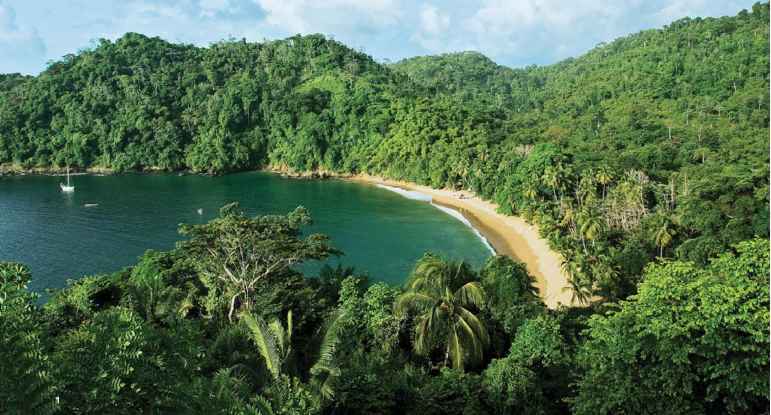 Next door to the thriving business center, steel-drum-music capital and up-all-night Latin culture of Trinidad is the island of Tobago, a place so green and unspoiled that it's hard to believe it's less than 60 miles from the bright lights of Port of Spain. AVERAGE WATER TEMP:72-82°F WHAT TO WEAR: Dive skin or shorty in summer; 3/2 mm in winter. AVERAGE VIZ: 20-100 feet, depending on outflow from the Orinoco River. WHEN TO GO: December-August generally provides the best viz. 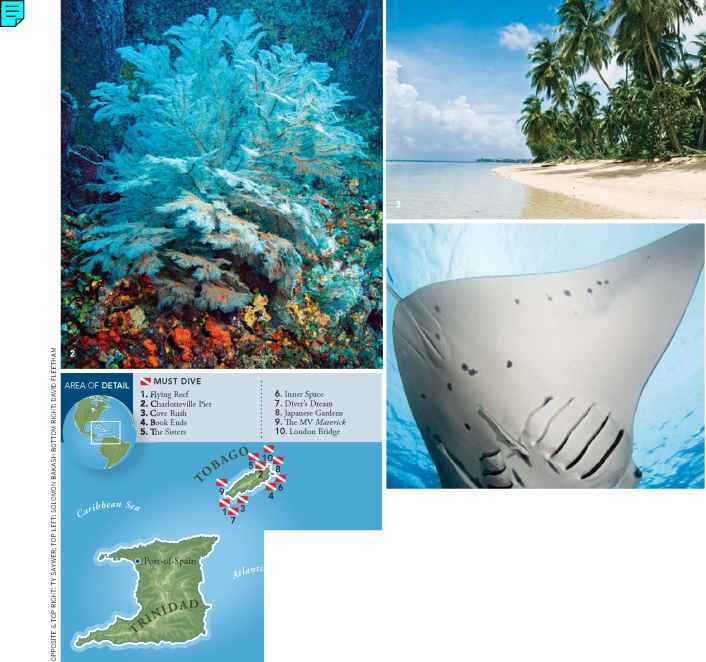 WHAT TO EXPECT: Currents can be strong, providing incredible drift diving. Look for current-sculpted sponges and roaming pelagics. LANGUAGE: English. TAXES: 15 percent VAT and 10 percent room tax. ELECTRICITY: 115-230 V; most newer hotels can handle U.S. appliances. TIME ZONE: Atlantic Standard Time (Eastern Standard Time plus one hour). Dive in Tobago and you will find yourself sharing the water with nurse sharks, lobsters and sea horses as well as the full range of Caribbean reef fish. At sites such as Bookends, you can have the otherworldly experience of diving under "clouds" of breaking waves while barracuda and tarpon hover in the turmoil and gaze down on you. And because so much of the diving is drift-diving, bottom time can be long, and the seascape is surreally water-sculpted and packed with diversity fueled by the nutrient-rich current. This just might be the place that invented the idea of "getting away from it all."